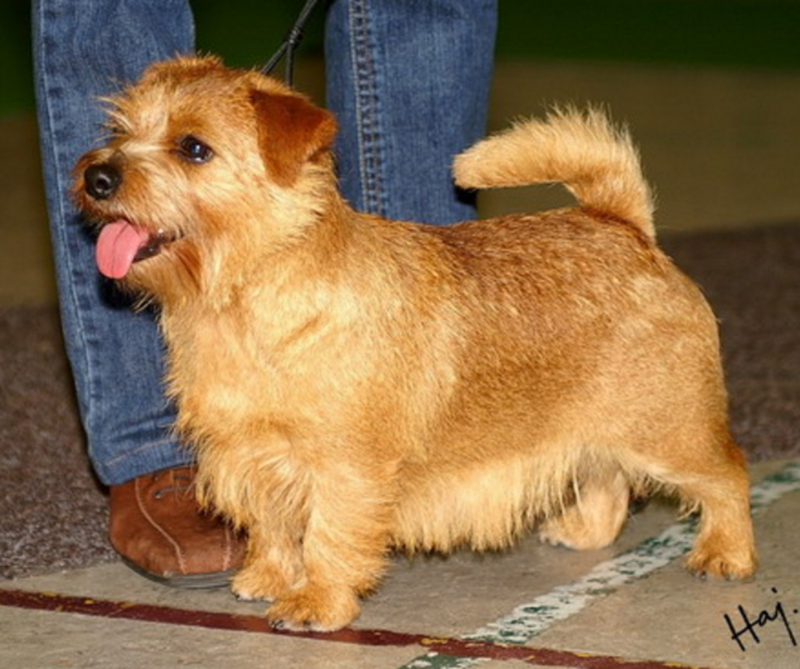 What is the main distinguishing feature between the Norwich and Norfolk terrier? Answer: if you answered A, the tail, consider that the Norwich terrier typically has a tail that’s medium docked. According to the American Kennel Club, the tail had to be of this length so to allow a man’s hand to grasp it. In the Norfolk, a docked medium tail is also called for, so the tail is not really a distinguishing feature. If you answered B, the eyes, consider that both the Norwich and the Norfolk have eyes that are small, dark and oval in shape with black rims. If you answered D, the teeth, sorry but both these breeds should ideally boast large teeth that meet nicely in a scissor bite. So the correct answer is C, the main way to differentiate a Norwich from a Norfolk is by looking at their ears! As mentioned, the Norwich and the Norfolk were once exclusively one breed, “the Norwich terriers.” Within this breed there were therefore prick-eared (P.E.) or drop-eared (D.E.) specimens. Then, in 1964, the British Kennel Club decided to separate the two. In 1979, the Norwich was officially recognized by the American Kennel Club. It got its own standard that is quite similar to that of the Norfolk, but the ears are the main distinguishing feature. 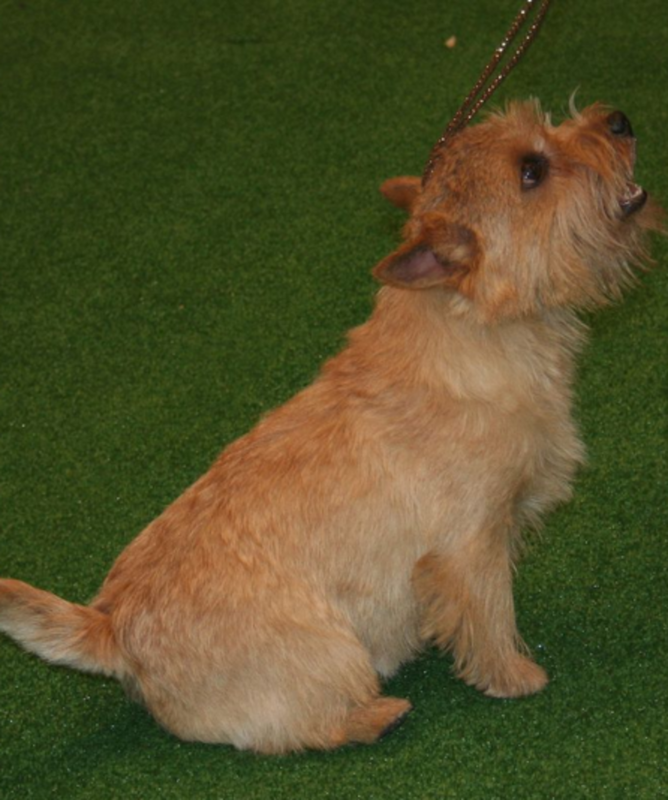 According to the standard, the Norwich terrier has ears that are erect, set well apart and with pointed tips. This gives the Norwich a more foxy expression compared to the Norfolk. The Norfolk terrier was officially recognized by the American Kennel Club in 1979, several years after the British Kennel Club had decided to separate the Norwich from the Norfolk. Before ear cropping became illegal, drop-eared specimens were often cropped so to have erect ears as the erect-eared specimens were winning more often in the show ring. To prevent complains over which specimen was better, the two types were separated into two different breeds in 1964. The Norfolk, unlike the Norwich has small v-shaped dropped ears that don’t fall lower than the corner of the eye. Those folks who love to touch dog ears, may be delighted in learning that the Norfolk’s ears are smooth and velvety to the touch. Other than having different ears, owners of Norwich and Norfolk report that there are some other subtle differences between the two breeds; however, some breeders may claim that the two breeds are exactly the same. Who is right? Most likely, it boils down to the fact that, as the breeds separated, they gained their own uniqueness and each dog developed its own personality. Fun fact: To remember the main difference between the Norwich and the Norfolk, many people think about the Norwich having pointed ears that stand up like a “witch’s hat.” And what about the Norfolk terrier? Perhaps we can think of them as “Nor-fold” terriers, the ones with folded ears! So there you have it, Nor-witch and Nor-fold terriers, no more confusion from now on!